Emma Gordon is the creative and crafty inspiration behind Bluebell Design Studio. She has always loved creating and in particular she has always loved jewellery. On presenting her mum with one of her carefully handcrafted necklaces for her birthday, Emma’s dad remarked ‘Perhaps you should think about doing this for a living’ and the idea was born. Emma spent most of her professional life in an adult training role. While she loved that aspect of her job, she did not enjoy the other things that came along with a high pressured, corporate environment. A square peg in a round hole, Emma decided to change her life and her career by becoming certifi ed as a PMC instructor. That was 8 years ago. Since then she has also completed Level 1 of the Art Clay Silver certification and has earned her Mid Cornwall School of Jewellery Silver Clay diploma. She regularly attends masterclasses in metal clay to keep up to date with new products and techniques and is an active part of the metal clay community. 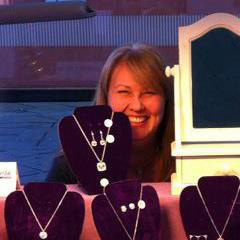 Emma regularly contributes to Making Jewellery magazine for articles on silver clay and chainmaille projects and she has also contributed to other jewellery making magazines in the past such as Bead Trends and Creative Beads and Jewellery. She sells her work in various galleries around Scotland and has showcased at the Scottish Parliament.